What is the name of the show? Rocky Mountain International Audio Fest or RMAF. What are the Show Specials? What Products are Launching at this year's RMAF? What is the name and address of the show venue? Please click here to make sleeping room reservations. What are the 2019 show dates and hours? Do you have the dates for future RMAF Events? The first RMAF was held in October 2004. This year RMAF will celebrate 16 years of bringing the best in high-end audio to Denver. RMAF is considered the largest consumer high-end audio show in North America. Attendees are music lovers, audiophiles, DIYers, videophiles, technophiles, students and teachers congregating in Denver to see the latest innovations. Many attendees are looking for a system and will seize this opportunity to compare brands, quality, and features before committing to a purchase. Our exhibitors are manufacturers, distributors, retailers and craftsmen from the international electronics industry. Where can I find the current exhibitor list? Visit the online RMAF Exhibitor List for the most up-to-date exhibitor information. Click here for the searchable list. On-site, pick up a copy of the RMAF Directory with exhibitor information, entertainment and seminar schedules. Where can I find the product list? Click here to search for a specific product or manufacturer. At the bottom of the page is a link to download an excel spreadsheet with all the information from this link. What other trendy stuff is happening at the show? Seminars, entertainment, software and a room full of the latest headphone gear. There will be product specials, product rollouts and more surprises. How much time should I devote to visiting RMAF? There are nine floors of exhibitor rooms, over 100 rooms to see. The furniture is removed from each room and an entire system set up for your listening pleasure. The RMAF registration area contains magazines, parts, furniture, cables and miscellaneous vendors. You be the judge but we recommend a weekend pass so you can come and go throughout the weekend. Gaylord Rockies Resort & Convention Center parking fee is $18/day. You can take the RTD A Line from Denver International Airport or Union Station. and get off at the 61st and Pena stop. It is 2 miles from the hotel. Information, schedules and fares can be found on the RTD website, http://rtd-denver.com. RMAF strongly recommends using public transportation to avoid parking fees. How many visitors is RMAF expecting? RMAF generally welcomes about 3,500 visitors from over 30 countries and 49 states. RMAF is open to the public - all are welcome. There are maps in the middle of the RMAF Directory to guide you. The volunteers at the registration desk can point you in the right direction. If you need additional assistance, please ask the volunteers at the Colorado Audio Society table. Is the show directory available online or as a downloadable app? Are cameras allowed on the show floor? Yes, all attendees are permitted to bring camera equipment onto the show floor. Exhibitors retain the right to restrict photography of their products or displays, and such decisions are within the discretion of the Exhibitor and are not controlled by RMAF. What are the food options at the Gaylord? The lobby bar offers a variety of local craft beers, cocktails, wines and more. Open for dinner. Freshly brewed Starbucks® coffee, snacks and quick meals for breakfast, lunch and dinner. This grab-and-go marketplace offers for coffee, breakfast pastries, chef-crafted entrees, and alternative snacks. Open for breakfast, lunch and dinner. You are welcome to check with the RMAF office during show hours and the hotel staff anytime for your lost article. What are the RMAF Office Hours? Yes, RMAF is open to the general public. All children are welcome. Children under 12 receive free admission but must be accompanied by an adult. Yes, spouses are welcome. There is a spouse outing on September 7, 2019. Spouses meet in the RMAF Office at 9:30am on Saturday. Please contact Marjorie Baumert at 303-393-7918 or [email protected] with your ideas for this year's outing. May I purchase my tickets before the show? Yes, online registration is open from January 28, 2019 through July 31, 2019 . You may purchase your tickets using a credit card. Click the Register Here button. Cash or checks ONLY are accepted at the Registration Desk during the show. May I purchase my tickets at the show? Yes, on-site registration is available daily ½ hour before the show opens. Payment is cash or check only. Do Industry Affiliates need to pay to purchase a ticket? Yes, you can purchase your ticket online or at the show. Click the Register Here button. May I buy any equipment at the show? Yes, exhibitors will be selling their show demo systems and show specials; others will gladly take your order and make delivery arrangements. May I buy Vinyl, CD, DVD or Blu-Ray at RMAF? Yes, you will find a wide selection of audio and video discs at RMAF. Many rare finds and collectors' items will be available. May I bring my own music to audition equipment? Yes, it is possible to listen to your own music on most systems, but please ask the individual exhibitor's permission. Where can I find the entertainment schedule? Please continue to check the website for frequent updates about live entertainment. Where can I find the seminar schedule? Please continue to check the website for frequent updates about seminars. Are the seminars recorded each year? Please contact Marjorie Baumert at 303-393-7918 or info at audiofest dot net. What airport should I fly into and ground transportation? The Denver International Airport, code DEN. Uber and Lyft are options used by many. Please go to Uber or Lyft. You can make Lyft reservations up to 7 days in advance. Denver now has a light rail option at DIA. You will take the A Line from the airport to 61st and Pena and then transfer look for the Gaylord Rockies shuttle. The shuttle runs every 20 minutes to and from the light rail station. 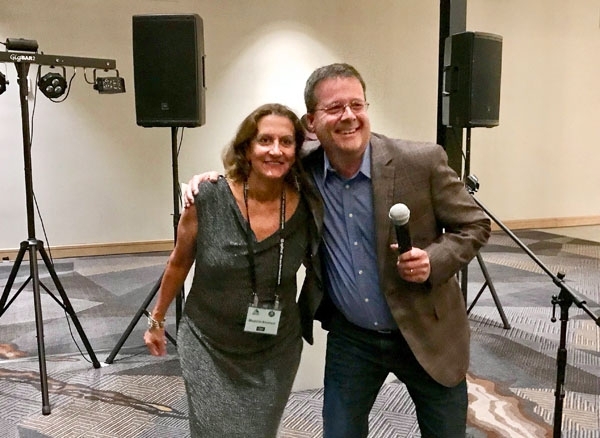 On the eve of the 15th annual Rocky Mountain Audio Fest, being held this weekend in the newly remodeled but acoustically challenged Denver Marriott Tech Center, show organizer Marjorie Baumert revealed the show's future venue: beginning in 2019, RMAF will relocate to its new home in the brand new Gaylord Rockies Resort & Convention Center, just five miles from Denver International Airport. Stationed perfectly at the edge of the Front Range, the brand-new Gaylord Rockies Resort & Convention Center in Aurora invites you to find sanctuary just minutes from Denver International Airport.